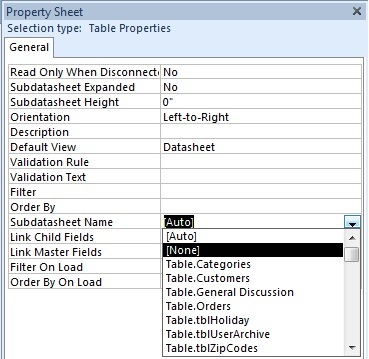 Microsoft Access Tip: Set Table Subdatasheet Name Property to [None], or explicitly specify the name. Microsoft Access subdatasheets are a valuable way to see one-to-many relationships from a table's datasheet view. It requires no programming to see the related records and is very compact display of subdatasheets with varying number of records. However, if you do not want this, you may be suffering a performance penalty. By default, the Subdatasheet Name property for tables is set to [Auto]. When the table is opened, the datasheet automatically looks for, and includes, a subdatasheet based on its table relationships. If you want this feature, it would be better to explicitly specify the subdatasheet table. If you do not want this feature, setting this property to [None] significantly improves performance, especially over a network, when you open the table. 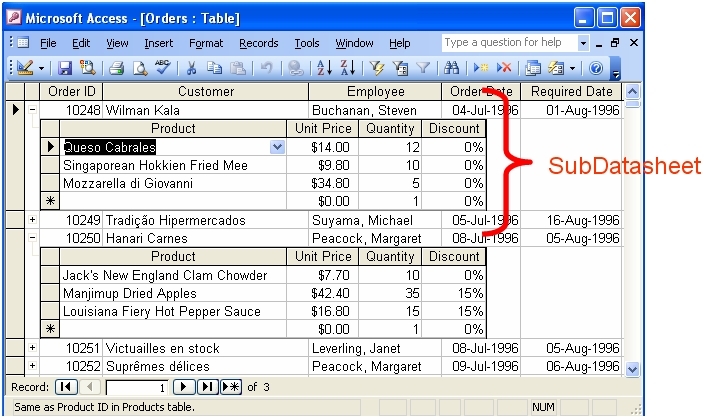 It also impacts references to the table from queries, forms, and reports. Our Total Access Analyzer performs detailed analysis of your Access database objects and detects every table that has this property set to [Auto]. It also finds hundreds of other ways to fix and improve the design and performance of your MSAccess databases.